The fuel price hike which is having multiple effects on the cost of living, has also raised the cost of private transport. 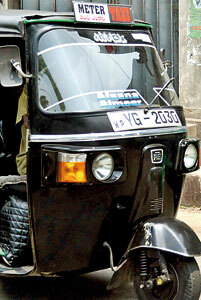 One of the least expensive modes of private transport, the three-wheeler is gradually turning out to be a luxury. A Sunday Times investigation reveals that commuters of three-wheelers are being systematically ‘robbed’ through the use of meters. The meters on some three-wheelers are genuine, as they are operated by reputed companies and charge according to stipulated rates. But others rig meters with rates ranging from Rs. 32 to Rs. 40 per km. There were others found to be resorting to adjusting the meter to charge the kilometre (1,000 metres) rate for every 800 or 900 metres. These developments come as the three-wheleer industry, widely seen as a self-employment scheme, has also been hit by three-wheelers flooding the market, with more than 138,000 three-wheelers registered last year, at an average of 390 three-wheelers per day. The All Island Three-Wheeler Drivers and Owners Association (AITWDOA) estimates that some 400,000 of the 700,000 registered three-wheelers transport passengers, making it extremely competitive. AITWDOA President G.S. Jayaruk told the Sunday Times that the industry was affected by the influx of three-wheelers, resulting in a decrease in hires. “What we are proposing to the government is to have a limited number of three-wheelers in a particular area, along with a price formula, depending on the area they operate. This would regulate the industry like that of the private bus industry,” he said. He pointed out that, as a result of an unregulated industry, commuters are affected by being overcharged, while there are clashes within the industry for lack of hires. The lack of hires for three-wheelers has led to unscrupulous practices among some of the operators. The All Island Three-Wheeler Drivers Trade Union believes that, with the introduction of a meter system, there have also been several instances of malpractices taking place. Union President Lalith Dharmasekara, founder of the Budget Taxi which commenced the meter taxi system, told the Sunday Times that, due to unscrupulous practices, commuters have begun to lose faith in meters. “In some instances, three-wheeler owners have requested their companies to adjust their meters for a revised rate at night. But we found that some of them are using it during daytime as well. For instance, some three-wheeler drivers charge Rs. 55 during day time, but watch out if the meter starts at Rs. 57, which means they are charging the night rate which is 15% more than the usual rate,” he said. He said that the Government’s offer to provide a fuel subsidy was a good idea, as it could help the three-wheeler owners to keep the prices low. “If that does not happen, the minimum rate could go up to Rs. 40 per km,” he added. However, some are opposed to the fuel subsidy system, saying it will not help the industry, as the difficulty in obtaining such benefits would be a waste of time. “The Government is offering only Rs. 10 per litre, limited to 3 litres per day, and 28 days per month. But in reality, we use more than 7 litres per day,” three-wheeler driver Anura Jinasena told the Sunday Times. H.M. Nizam, a three-wheeler driver from Keselwatte, told the Sunday Times that, despite Government offers of a fuel subsidy, nothing practical has been done. “We operate three-wheelers from a taxi stand and our charges are estimated on the distance and its duration,” he said. He claimed they were cheaper than the meter taxies when it involves a round trip. “A meter taxi will charge the same rate both ways, while we do not add anything as waiting charges,” he added. “I need a daily profit of Rs. 1,000 for my five-member family to survive, and also save something for repairs, when the need arises. Usually, to earn that, I operate from 7 a.m. to 7 p.m., but now, there are times I no longer earn that amount, and have to even work on Poya days,” Nizam lamented. “Even when it comes to repairs, I try to put them on hold, as their charges too have increased,” he said. Some of the three-wheelers have been forced to install meters, as commuters are now increasingly opting for metered taxies. However, many of them do not have a network where hires are provided to them through a call-centre. Instead they pick up passengers from the roadside. “One of the disadvantages in operating without a network is that we have to return to our original stand, without a hire for the return journey. Therefore it adds to our losses”, K. Mohamed (56) from Slave Island told the Sunday Times. However, Amila Eranga from Piliyandala, a three-wheeler driver who works for an established company with a call-centre facility, told the Sunday Times that we are offering the lowest rates despite increasing the charges by Rs. 2 per 100 metres. “This is not a loss for us, as we are assured of hires at the end of each journey,” he said. Many three-wheeler commuters told the Sunday Times that, though meter taxies has reduced exploitation, some of the three-wheeler operators make use of the meters to exploit commuters, which the Government needs to keep a tab on. “I have seen three-wheelers have stickers indicating Rs. 30 per km, but actually, the charges are more,” Nihal Wasantha, a private sector employee from Kollupitiya said. 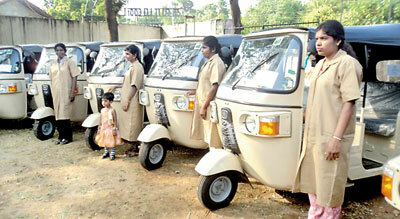 A new chapter begins in the Jaffna town with ten three-wheelers operating services with women drivers. Women face many problems with the three-wheeler drivers when they hire a vehicle and travel alone. Many women are scared to travel alone in three-wheelers driven by men.